Let's see what you saw this year. I emphasize "see" because it'd be awesome to see more photos on here. Monday MENH spent a portion of the day tied down at Hornell. The crew apparently outlawed. Speculating- crew from OL-1 was brought over to bring the train back to Olean. Today NS symbol KH52 is currently (133pm) around North Eldred, heading south, on the Buffalo Line. This should be DFT. LA&L #432 and #425 leading an uncounted amount of cars (I wanna estimate 20) into Gennessee Junction today. Here's a new trend: Cameraphone railfanning! Photos taken with my TREO. Are they still running trains on the LAL or has the railroad shut down for the winter? 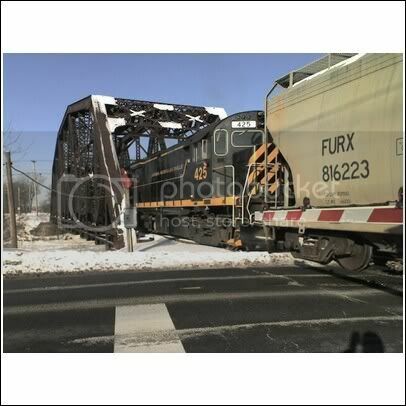 Sandy Burton wrote: Are they still running trains on the LAL or has the railroad shut down for the winter? No, it appears to be quite busy as a snowmobile trail. I've been hearing them come through Henrietta fairly late at night, but I can't tell which way they're headed. By late I mean often after midnight. WNYP hasn't been super busy on the Buffalo line either. and it seems when they DO come down.. it's LATE at night. somewhere around 2200Hrs onward, but I haven't seen them active on the line during daylight. Ususally see half of a consist waiting for a re-crew, or something like that during the day. WNYP DFT out of CP Emporium at around 530PM with 36 loads. I live less than a mile from the Martin Road / East River Road / Erie Station Road crossings. It is not CSX. You could also be hearing the R&S. Rest assured, the LA&L is running on a daytime schedule. Rochester & Southern train RS-1 has been working Silver Springs 8-10pm plus minus. So you probably hear their northbound SR-2 run. -B&P train KH29 is south/west-bound approaching Machias, NY. 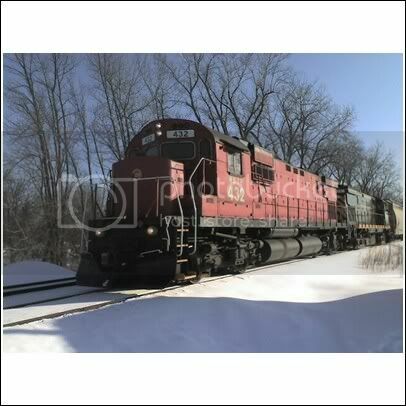 -B&P train KH32 is on its way to Keating, Pa.
-There have been 5 or 6 NS locomotives and 3 RJC locomotives at Keating all weekend awaiting coal / hopper trains. -Driftwood has 15 loads for the WNYP, 16 empties for the NBER, and 105 empty hoppers for the B&P. -Further down the Buffalo Line H2W and H3W just met at "Fair" siding. OL-1 has been running a variety of directions including the Olean - Hornell line in place of MEHN/HNME which now is essentially MEOL/OLME again (like 397/398). It is generally a day job, but this too varies. OL-2 was the night job, which does Farmers Valley as the wax customer on the Farmers Valley must be switched at night. DFT has been varying day or night and different days of the week. As of 1130 KH53 is south out of Olean at "South Eldred". The RJC train is also on the move south out of Keating as train KH-33. As of 130pm WNYP KH53 (usually OL-2) has moved further south to "Kean", while WNYP OL-1 has arrived at Hornell. dft-26 northbound tonight with a few loads and 637 with 630 leading. The crew gave me a nice salute with the horn tonight. I was happy about that. Not sure who the crew are, but THANK YOU guys! It was a nice gesture. Minutes past noon LAL #418 rolled into Avon running light. Anyone know why they are out on a Sunday, it's such a rare occaision? 418 ran light to Genesee Jct, got some hoppers and switched out Barilla and returned to Lakeville light about 3PM. This happened two weeks ago as well ... This is seemingly more common.